Train without limits with the new Fēnix 5, Garmin's premium multisport GPS watch. With wrist-based heart rate, advanced training features and now even higher resolution outdoor optimised Chromo colour display for great readability even in bright sunlight. 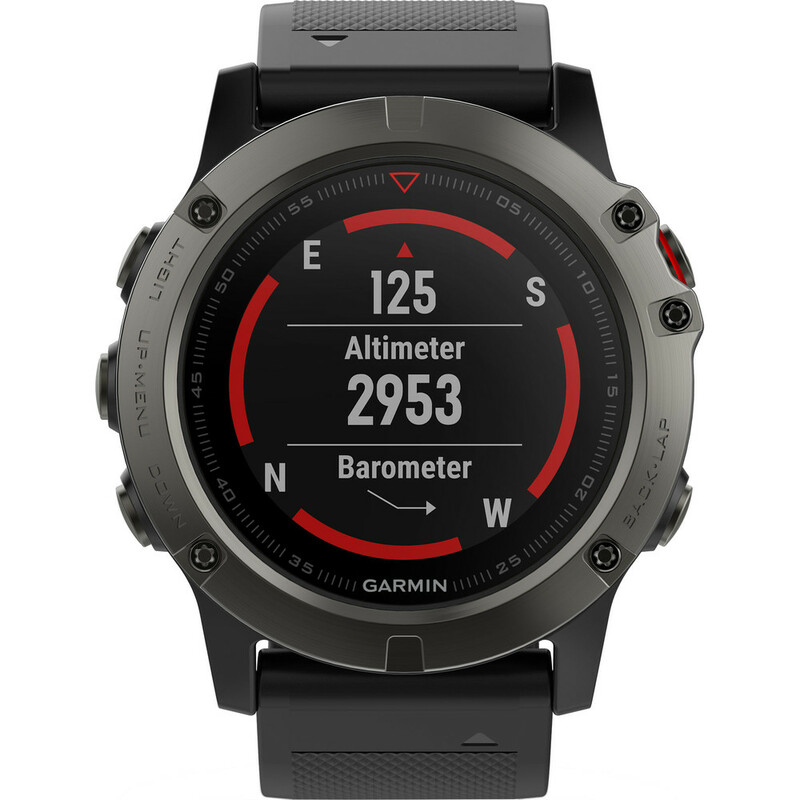 Fenix 5X it’s the first Fēnix series watch to offer full-colour European recreational mapping for at-a-glance navigation and location reference. This model has sapphire lenses that will withstand all your adventures without a scratch. The always on, high-resolution, full-colour Garmin Chroma Display assures great readability at any time. fēnix 5 makes use of 1.2’’ display with transflective technology that reflects and transmits light at the same time enables the watch face to become even better readable under intense sunlight. To guarantee enhanced durability of this sport watch over time fēnix 5 Sapphire editions offers a high quality scratch-resistant Sapphire lens. Now you can go further with your running data. Garmin training features that tap into extended physiological metrics and advanced running dynamics2 can help improve your form and overall performance. These metrics include performance condition that compares your actual condition to your average fitness level, running cadence, and stride length. Make every run a personal challenge, compete against others on Strava Live Segments, get alerts for segment starts and finishes, view leaderboard rankings, and see how your current effort compares to your personal record. fēnix 5 comes pre-loaded with features that make all the difference on the trail. The Auto Climb/Run feature makes sure you get the right metrics in the right environment. It will track pace and distance when running on the flat and automatically switch to accumulated ascent and vertical speed once you start climbing. For the Ultra distance runner fēnix 5 provides a special mode that allows you to extend tracking to take it much further and track up to 35 h in the new gyro-reinforced UltraTrac mode. Each fēnix 5 guides you safely on and off the beaten path combining GPS/GLONASS positioning, advanced sensors and well known Garmin navigation features like TracBack. To provide the most accurate information the device auto-calibrates its sensors using GPS. The built-in altimeter provides elevation data to accurately monitor ascent and descent, while the thermometer and barometer can be used to predict weather changes by showing short-term trends in air pressure. 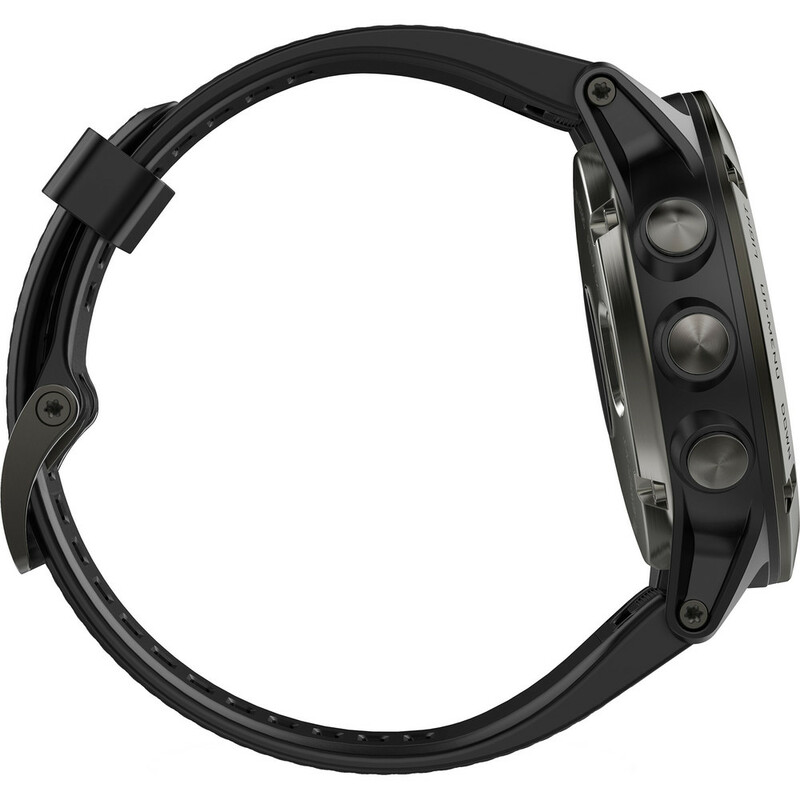 The 3-axis electronic compass keeps your bearing, whether you’re moving or not. All fēnix 5 series models can support smart notifications when paired with a compatible device. 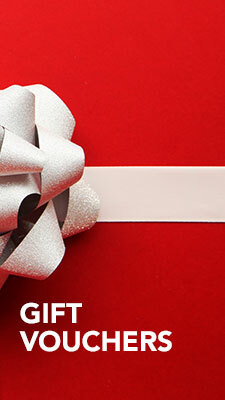 Receive emails, texts and alerts right on your watch. 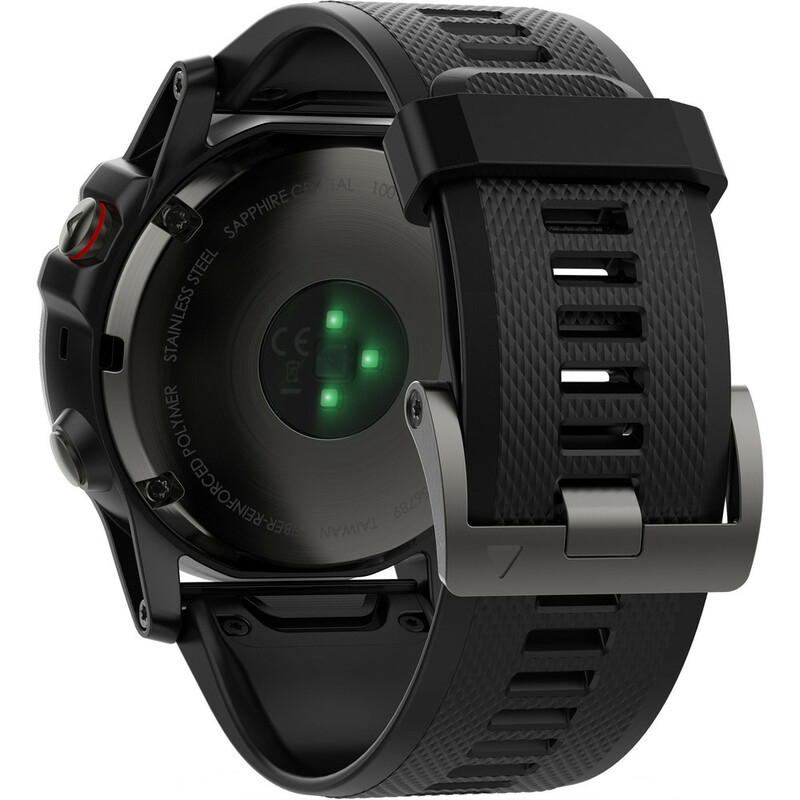 Another new fēnix 5 feature is GroupTrack4 that allows you to pair your device through Garmin Connect so you can keep tabs of your connected buddies, and they can keep tabs on you when you get separated during an activity. 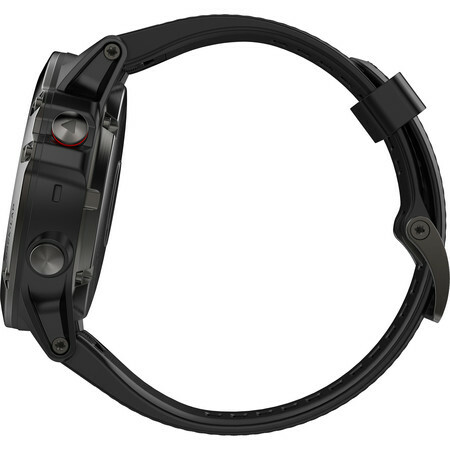 Other connected features include automatic uploads to our Garmin Connect, live tracking and social media sharing through our free Garmin Connect Mobile applications. All fēnix 5 Sapphire models are Wi-Fi-enabled so your watch can connect to your wireless network and automatically send activity uploads for sharing on Garmin Connect. 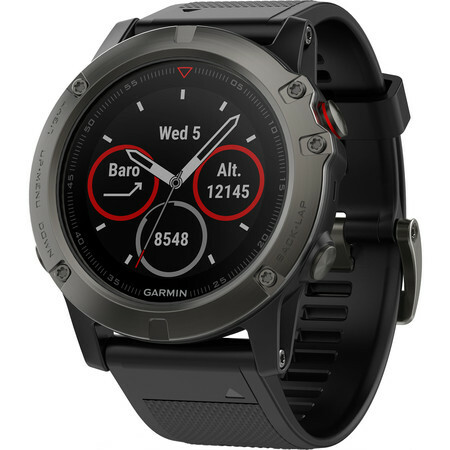 You can also download the free Garmin Face It watch face app to customise your fēnix with any photo from your smartphone. Just download the app, choose an image from your photo library, adjust the style for time and set it as your watch’s face. Whether it’s a scenic view from your last hike or a picture of your new puppy, with Garmin you can add personality to your watch that’s uniquely you.